Bournemouth moved clear at the top of the Championship with victory over a Watford side that played all but the first 28 seconds with 10 men. Watford defender Gabriele Angella was sent off for a lunge on Callum Wilson, even though he was not the last man. Bournemouth were awarded a penalty when Wilson was brought down by Craig Cathcart and Yann Kermorgant converted. The Hornets responded positively but Matt Ritchie added a second after the break with an angled finish. Bournemouth are now three points above Derby County, who travel to mid-table Cardiff City on Saturday. The task for Eddie Howe's side, who drew 1-1 with Watford at Vicarage Road in September, was made easier when Italian centre-back Angella received a straight red card after he brought down Wilson. 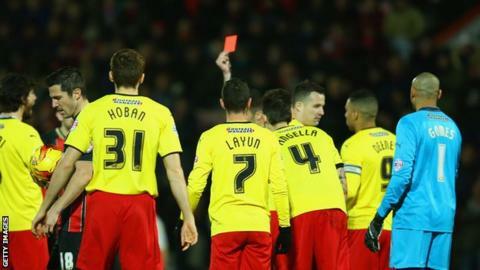 Watford's players protested against referee Lee Probert's decision, arguing that covering defender Cathcart was the last man. There was less disputing the penalty Probert awarded to the Cherries just after the half-hour mark when Cathcart felled Wilson inside the box. Kermorgant elected to go straight down the middle with the spot-kick and was relieved to see the ball go past Watford goalkeeper Heurelho Gomes. Ritchie effectively sealed the contest 12 minutes into the second half when he struck a low shot into the net. Match ends, Bournemouth 2, Watford 0. Second Half ends, Bournemouth 2, Watford 0. Substitution, Bournemouth. Brett Pitman replaces Callum Wilson. Substitution, Watford. Bernard Mensah replaces Troy Deeney. Delay in match Eunan O'Kane (Bournemouth) because of an injury. Foul by Daniel Pudil (Watford). Substitution, Bournemouth. Adam Smith replaces Matt Ritchie. Attempt saved. Marc Pugh (Bournemouth) left footed shot from the centre of the box is saved in the top centre of the goal. Assisted by Eunan O'Kane. Attempt blocked. Miguel Layún (Watford) right footed shot from a difficult angle and long range on the left is blocked. Tommy Elphick (Bournemouth) is shown the yellow card for a bad foul. Matej Vydra (Watford) wins a free kick on the left wing. Corner, Bournemouth. Conceded by Tommy Hoban. Attempt missed. Troy Deeney (Watford) right footed shot from outside the box misses to the left. Assisted by Matej Vydra. Substitution, Bournemouth. Eunan O'Kane replaces Yann Kermorgant. Attempt saved. Matt Ritchie (Bournemouth) right footed shot from the right side of the box is saved in the bottom right corner. Assisted by Harry Arter. Corner, Bournemouth. Conceded by Craig Cathcart. Attempt blocked. Matej Vydra (Watford) left footed shot from outside the box is blocked. Matej Vydra (Watford) wins a free kick in the defensive half. Attempt saved. Simon Francis (Bournemouth) right footed shot from outside the box is saved in the centre of the goal. Assisted by Callum Wilson. Substitution, Watford. Matej Vydra replaces Odion Ighalo. Attempt missed. Callum Wilson (Bournemouth) right footed shot from outside the box is high and wide to the right. Assisted by Yann Kermorgant with a headed pass. Attempt saved. Yann Kermorgant (Bournemouth) header from the centre of the box is saved in the bottom right corner. Assisted by Matt Ritchie with a cross. Attempt saved. Simon Francis (Bournemouth) right footed shot from the right side of the box is saved in the bottom left corner. Assisted by Matt Ritchie. Attempt blocked. Callum Wilson (Bournemouth) right footed shot from the right side of the box is blocked. Assisted by Matt Ritchie. Corner, Watford. Conceded by Steve Cook.